So I snagged a North American Amiga 500 on sale at a flea market. I purchased a DSub to VGA connector in the hopes I could get some color output. After getting strange Horizontal sync on my monitor, I realized that I needed a 15 kHz monitor, which I do not have and are not easy to find. 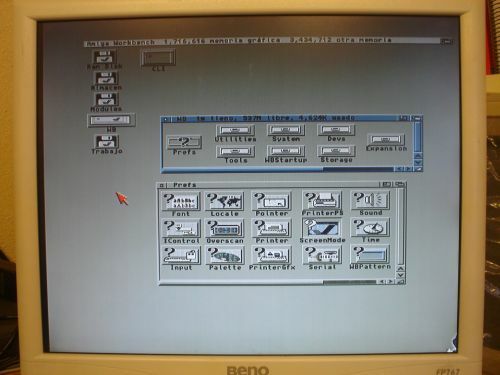 Unlike later Amiga computers which supported composite video, the A500 needs an RF modulator, the Amiga 520A which sticks out like parasite on the back of the machine. After ordering one on ebay, i found out I still had no color. 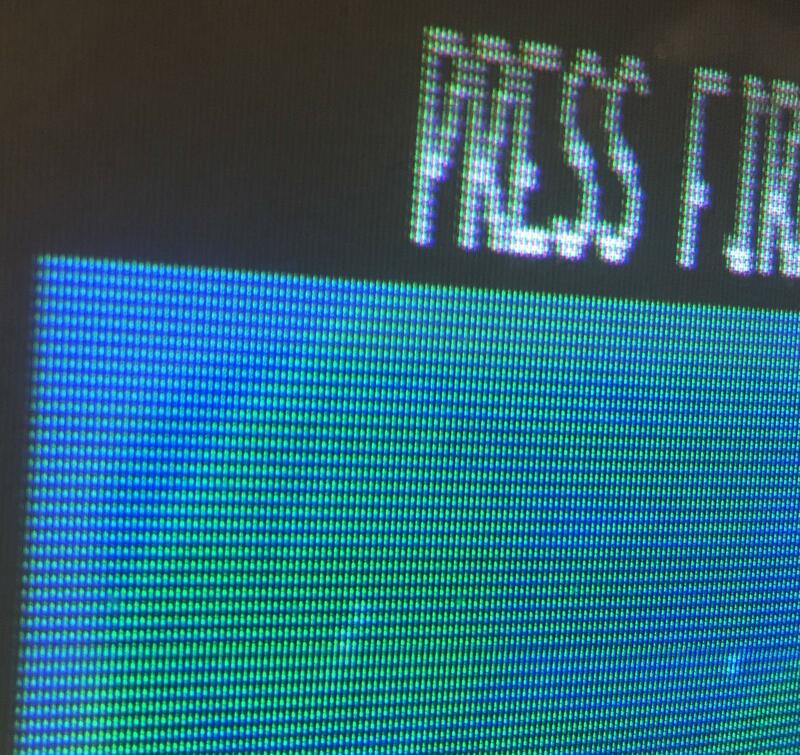 It turns out that the A520 was PAL (German I believe) and does not produce color on NTSC. North American 520A are really hard to find. Are there any cheap alternatives? I am open to making direct modifications to the machine. 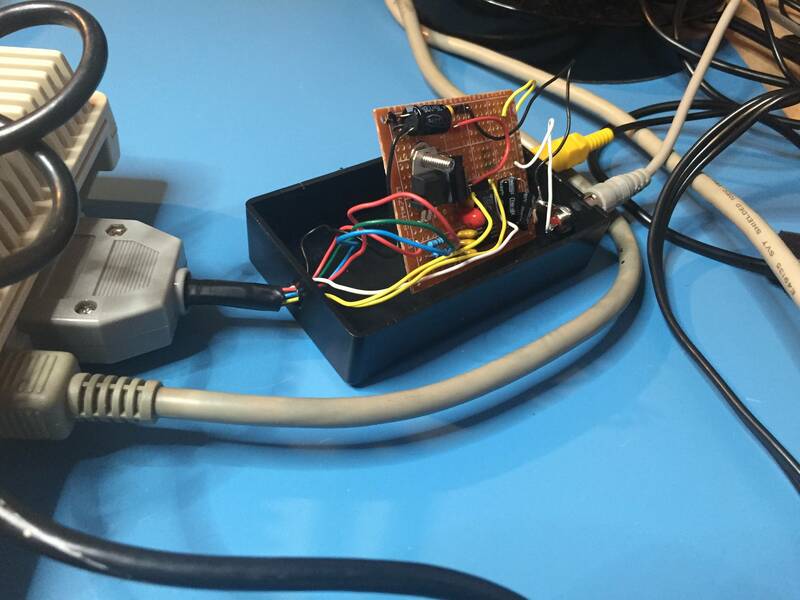 Your first choice is to see if with a little modification, the A520 box can be used as a NTSC encoder. 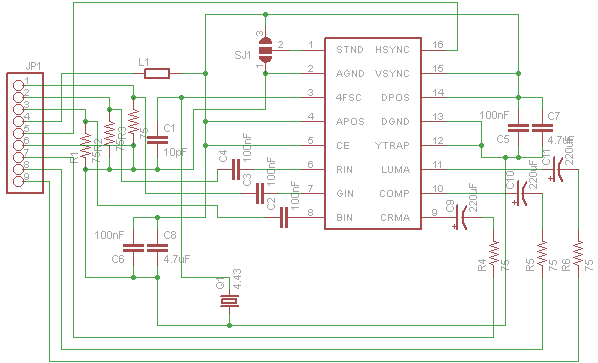 Open it, locate chip MC1377, take pin 20 (which will be unconnected) and ground it. 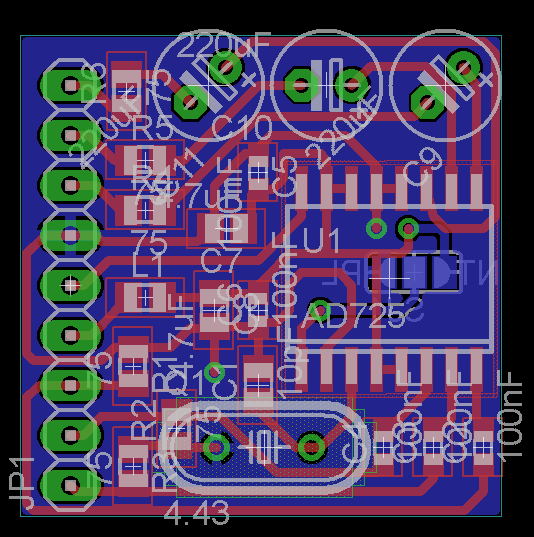 That will make the chip to act as a NTSC encoder. I don't know if this will be enough, as there seems to be some resonant circuits all over the board, that may be tuned to PAL frequencies. Anyway, it's worth a try. This is the same Workbench, but in a 640x512 interlace mode. The interlace mode does not flicker at all. It's steady and clear. Second alternative: use a RGB-to-CVBS converter. 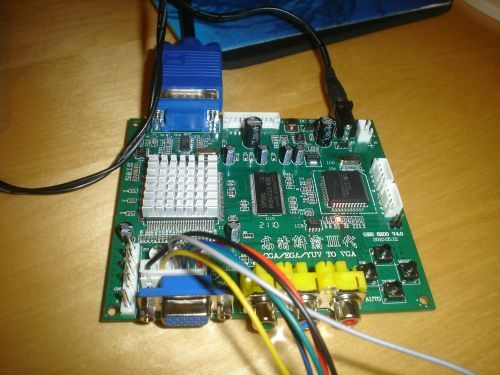 There are a few projects based upon the AD724 encoder chip, wich can generate either a PAL or NTSC signal. This link, for example, shows a hobbyist approach. 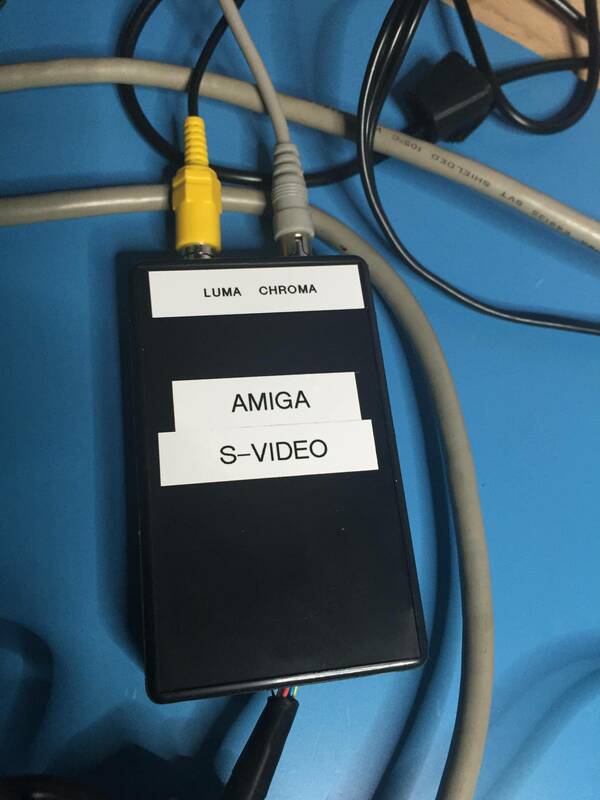 A friend of mine, Antonio Villena, designed and built a more professional encoder, which can be fitted inside the Amiga box. 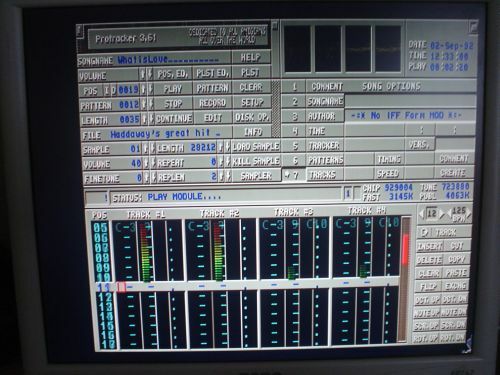 You can then route the composite video output to the monochrome composite output on the Amiga 500, first cutting the track that carries the monochrome video output from the Amiga board, for a complete internal solution without having to drill a single hole into the case. He sells them for 5 euros. 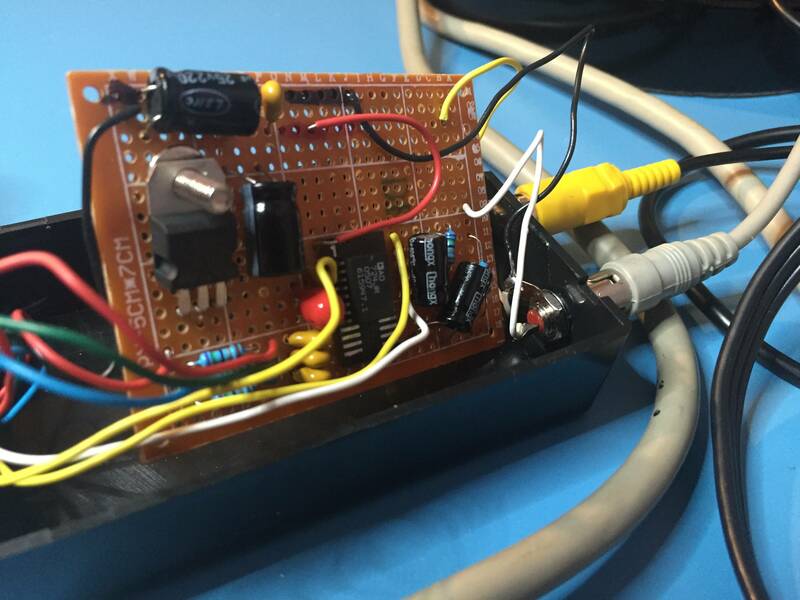 Q1 crystal can be changed to a 3.57 MHz NTSC one, and the solder jump SJ1 configured to make the encoder to output a NTSC signal. 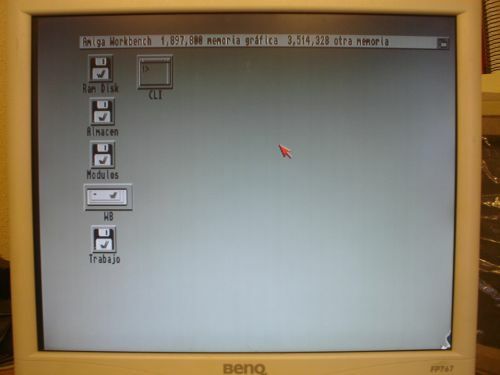 I think it really depends on what type of use you want out of your Amiga. If sharp text and sharp Workbench are important, then a high quality scan-doubler is going to be the best option...but, expensive. I tried the GBS-8220 everyone raves about and I really don't see how people can use that thing. Maybe I got a bad one. But in my experience, the image was never clear. The interface is a nightmare to use. The card is huge and gets hot. And, the picture was terrible. Lots of artifacting and blurring. Your mileage may vary but I was certainly not impressed. So what I did was set out to build my own S-Video converter. Next, I needed two expensive parts. An AD724 and a DB23 connector. Some people take a DB25 and saw it or somehow make it fit. I didn't like that approach. Luckily, I was able to find a solder-tail DB23 on eBay for about $8. The other expensive part is the AD724. They are about $11-$14 USD if you buy them new from Mouser. I was pretty lucky in that I managed to get three for FREE. I signed up at Analog Devices (the maker) and requested free samples. I've also bought them for less on eBay. The other parts are pretty cheap like some resistors, enclosure box, etc. Now, it's not pretty...but it works GREAT. On my 1084S monitor, the image is awesome. Text isn't that great (you need VGA for that) but I mainly play games. The image even looked great on my 42" plasma. 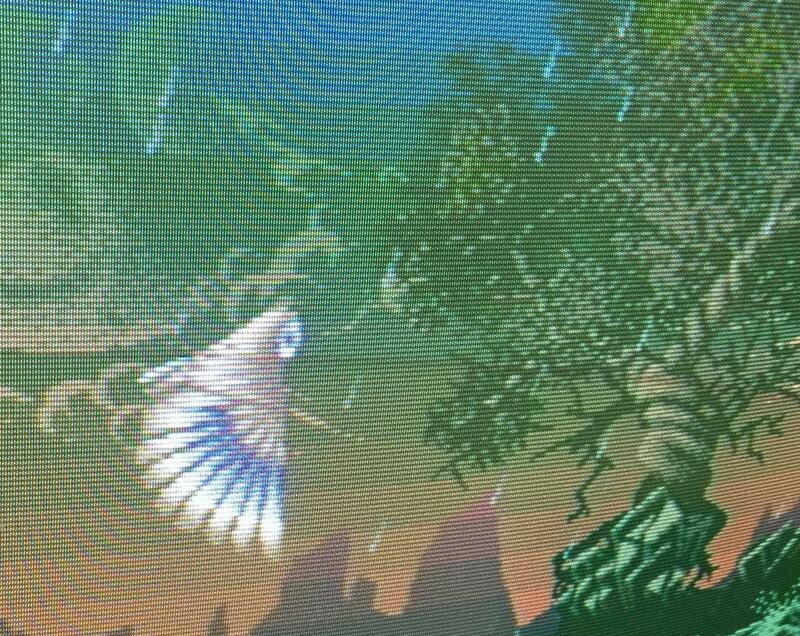 Ignore the moire pattern and scanlines from the pics below. The real images are actually really nice. So my suggestion is to just build that circuit. It's actually not hard. 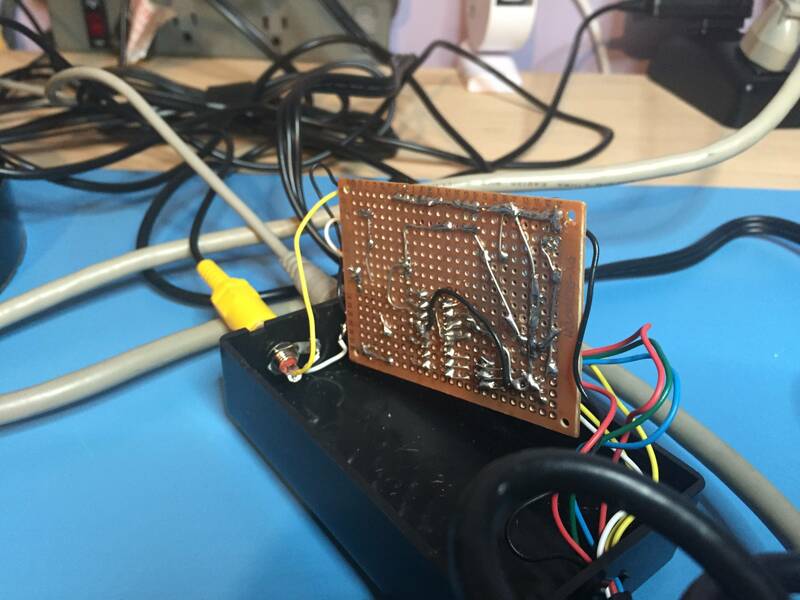 The hardest part will be adapting the surface mount AD724 to a breadboard-friendly version. There are cheap adapters online for that as well. If you can't solder or feel this would be too difficult, perhaps find a friend that can. Or, look me up on Lemon Amiga. I might be able to build you one. Notice, too, that I pulled out two separate lines for chroma an luma to get S-Video. What I don't show in these pics is that I also made a custom S-Video cable to go to a normal TV. Not the answer you're looking for? Browse other questions tagged video amiga-500 or ask your own question.